A "dangerous offender" who caused "permanent disfigurement" to a 15-year-old boy's face in what was described as an unprovoked attack has been jailed. The teenager was assaulted on 30 June at about 19:30 BST at a recreation ground in Stowmarket, Suffolk. 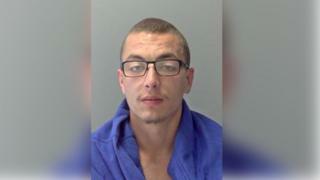 Joshua Williams, 22, of Kent Road in the town admitted causing grievous bodily harm. The judge at Ipswich Crown Court sentenced him to nine years in prison plus three years on extended licence. Speaking after the hearing, Det Con Victoria Keeble said the force was with the sentence for a man she described as a "dangerous offender" who repeatedly punched and stamped on the victim's head after he had felled him at the site on Recreation Road. She said the attack on Recreation Road was "nasty" and "unprovoked", leaving the boy with a number of broken bones in his face, which will require ongoing surgery. He can no longer take part in activities he used to enjoy, such as football and parkour, as any further injury could cause significant permanent damage, she said. "As a 15-year-old boy, he can't go out and play with his friends as he used to," said Det Con Keeble. But, she said: "He is a very spirited and active young man, who is now setting out to rebuild his life and carry on trying to enjoy his life." On release, he will be subject to a six-year restraining order, preventing him from contacting the victim and his family, and from going to Stowmarket.